Obituary for Alice Lee (Leisenring) Shull | Harman Funeral Homes & Crematory Inc.
Alice Lee Shull – 91, commonly known as Lee and formerly of Drums, PA, passed away peacefully in Waitsfield, VT in the comfort of her home and family on Thursday evening, January 31, 2019. Born in Hazleton, PA on September 16, 1927 she was the daughter of the late Albert Conrad Leisenring II and Helen (Pardee) Leisenring. On February 24, 1962, she married William Richard Shull in Sybertsville, PA. William predeceased Lee on September 28, 2013. Lee was a graduate of The Master's School 1945, attended DePauw University and Wood Tobé-Coburn School of fashion. She worked at Bonwit Teller and Strawbridge and Clothier as a young adult. She was active in her community. 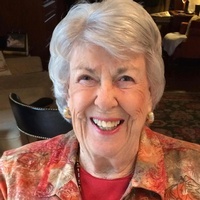 She served on the United Charities Board for many years and was supportive of the YWCA. She was an avid gardener, and enjoyed playing golf, tennis, bridge, and many other games. Her passion was traveling the world with her husband, children and grandchildren. She lived a full and good life, and was sweet and loving to all she knew. Lee is loved and mourned by her daughters, Jennifer Boland and her husband, John of Waitsfield, VT and their children, John Boland, Jr. of Boston, MA, and Sarah Boland of Waitsfield, VT, Marjorie Shull-Toohey and her husband, Michael and their daughter, Samantha Toohey and her fiancé, Matthew Borys of No. Scituate, RI; a sister, Elizabeth Doan and her husband, Foster of Drums, PA; a brother, Albert Leisenring III and his wife, Flora of Olympia, WA; as well as many nieces, nephews and extended family. Lee was predeceased by a daughter, Constance Shull, and a sister, Helen Vaughn. A Memorial Service will be held Saturday, April 20, 2019 at 2 pm from Harman Funeral Homes & Crematory Inc. (East) 669 W. Butler Drive, Drums. Friends may call at the funeral home Saturday from 1 pm until the time of the service. Interment will take place privately in Conyngham Union Cemetery.